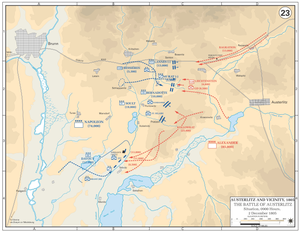 The Battle of Eckmühl fought on 21 April – 22 April 1809, was the turning point of the 1809 Campaign, also known as the War of the Fifth Coalition. 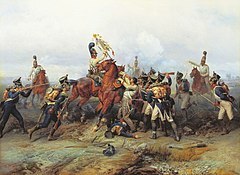 Napoleon I had been unprepared for the start of hostilities on 10 April 1809, by the Austrians under the Archduke Charles of Austria and for the first time since assuming the French Imperial Crown had been forced to cede the strategic initiative to an opponent. 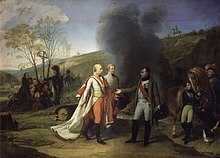 Thanks to the dogged defense waged by the III Corps, commanded by Marshal Davout, and the Bavarian VII Corps, commanded by Marshal Lefebvre, Napoleon was able to defeat the principal Austrian army and wrest the strategic initiative for the remainder of the war. 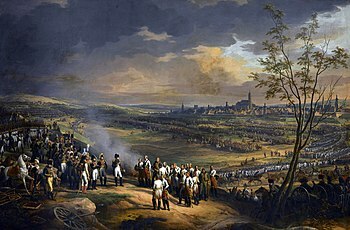 The twin battles of Jena and Auerstedt were fought on 14 October 1806 on the plateau west of the river Saale in today's Germany, between the forces of Napoleon I of France and Frederick William III of Prussia. 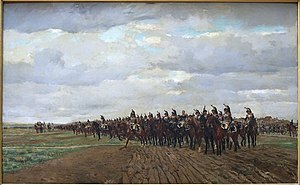 The decisive defeat suffered by the Prussian Army subjugated the Kingdom of Prussia to the French Empire until the Sixth Coalition was formed in 1812. The Battle of Laon was the victory of Blücher's Prussian army over Napoleon's French army near Laon. Feldmarschall Johann Karl, Graf von Kolowrat-Krakowsky joined the Austrian army, fought against the Kingdom of Prussia and Ottoman Turkey before being promoted to general officer rank. During combat against the French in the French Revolutionary Wars, he first became known as an artillery specialist. In the Napoleonic Wars, he commanded corps in the 1805 and 1809 campaigns. He became the Proprietor (Inhaber) of an Austrian infantry regiment in 1801 and held that position until his death. Jacques Desjardin or Jacques Jardin or Jacques Desjardins; enlisted in the French royal army as a young man and eventually became a sergeant. During the first years of the French Revolutionary Wars he enjoyed very rapid promotion to the rank of general officer in the army of the French First Republic. In May and June 1794 he emerged as co-commander of an army that tried three times to cross the Sambre at Grandreng, Erquelinnes and Gosselies and each time was thrown back by the Coalition. After that, he reverted to a division commander and saw more service in the north of France, Belgium, and the Netherlands. In the campaign of 1805, he led an infantry division under Marshal Pierre Augereau in Emperor Napoleon's Grande Armée and saw limited fighting. In 1806 he fought at Jena, Czarnowo and Gołymin. He was mortally wounded at the Battle of Eylau on 8 February 1807 and died three days later. His surname is one of the names inscribed under the Arc de Triomphe, on Column 16. The Battle of Mariazell or Battle of Grossraming saw the advance guard of the French III Corps attack a retreating Austrian force led by Maximilian, Count of Merveldt. The advance guard, led by Étienne Heudelet de Bierre overwhelmed their demoralized enemies, capturing about half of them. Marshal Louis Davout commanded the III Corps. The action occurred during the War of the Third Coalition, which is part of the Napoleonic Wars. Mariazell is located in the Austrian province of Styria, about 50 kilometres (31 mi) south of St. Pölten.